It's been a while since I posted photos of some of the things I've been making. So I guess it's time for a little Show & Tell. As you can see, my love affair with sewing on paper continues. 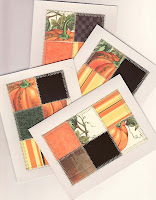 The new paper patchwork cards are themed: tea, knitting (made from recycled yarn/knitting catalogs), and Halloween/autumn. I made prototypes of them for various swaps and extras to sell in the shop. What else? 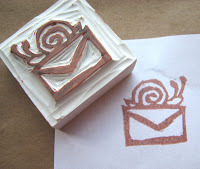 Several little rubber stamps with a Snail Mail theme. I'm hoping to do more stamps to sell as I have time. I made a sister of the bag pictured for my swap partner in the "Starbucks and Yarn" swap. 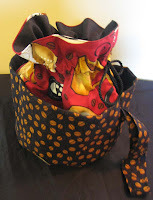 The fabric is coffee cups and coffee beans. This one's up for sale. 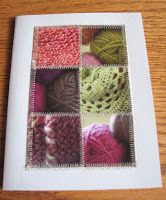 Great for small knitting projects (like socks) or as a handbag!